dreamthinkspeak are the leading creators of site-responsive performances; where the audience walks through the production as opposed to it happening on a stage. Since its formation in 1999, the company has been a pioneer of such work in the UK and around the world. For their experience (part of Hull’s City of Culture) called ‘One day, Maybe’, a replica shopping-mall was installed on one floor, while pop videos played along one wall and boutiques lined the other side. Armed with hand-held smart devices supplied by obsequious representatives of the “Kasang Corporation”, and a stash of virtual currency, visitors we’re encouraged to go on a digital shopping-spree. Over 600 Live Beacons were strategically placed throughout the maze, in order to provide real-time positional information for both players and performers. With sub-meter accuracy over a 500 metre-square floor space, this represents the most accurate beacon deployment ever installed in the wild. Every move made was tracked and logged, eventually providing a vaguely sinister customised personal assessment. Progressing on this protracted quest, up and down stairs, in and out of gloomy old offices, moods shifted. The design was intended to inspire disorientation in a “game-zone” style maze of corridors, to be navigated against the clock, dodging guards. 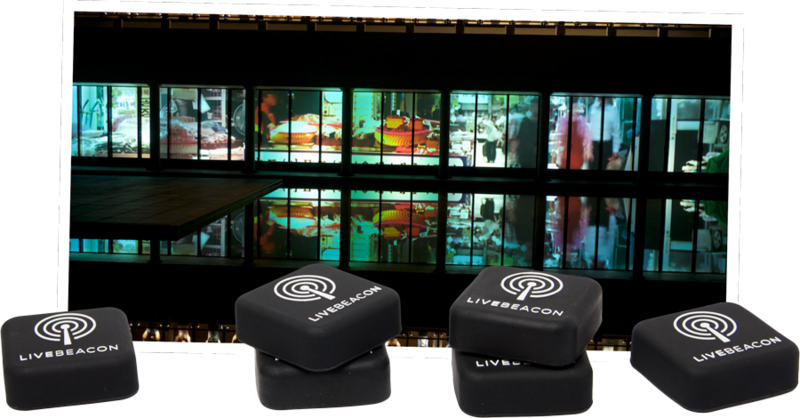 A highly bespoke web app was created and delivered by Live Beacon to work seamlessly with the Live Beacons and the end-user iPads. The end result was a first-of-a-kind interactive experience that received stellar reviews from the trade press and public alike.